While there are few things better than perfectly ripe and in season avocado drizzled with olive oil and sprinkled with sea salt, or smashed on toast made from really good sourdough, I do love to get creative with avocados and take advantage of their creamy texture by blending them into sauces, puddings, and dressings. For this green curry sauce, I used avocado as a base instead of coconut. So if you're one of those (weird) people who doesn't like coconut but loves the idea of curry, this is the recipe for you. If you do love the taste of coconut, feel free to throw a few tablespoons of coconut cream into the mix! 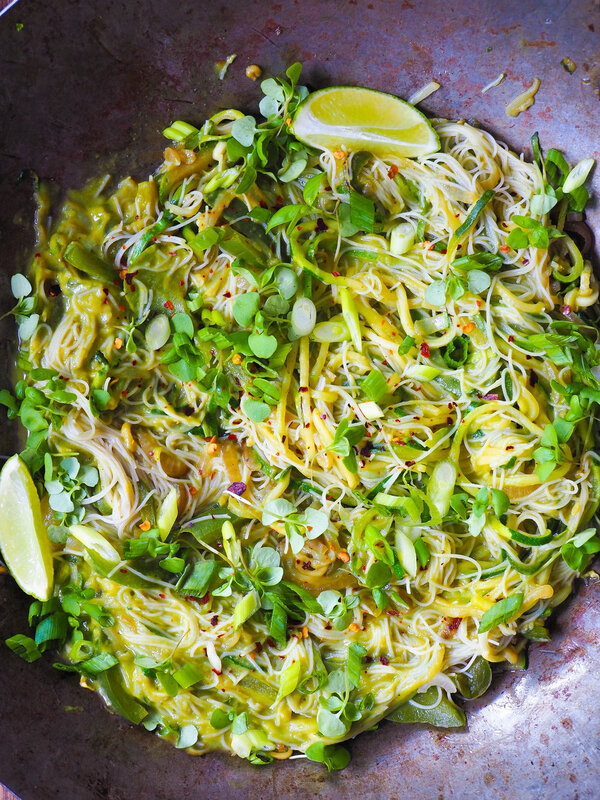 To keep with the green theme, I stir fried green peppers and zoodles before tossing with rice noodles and the avocado curry sauce. 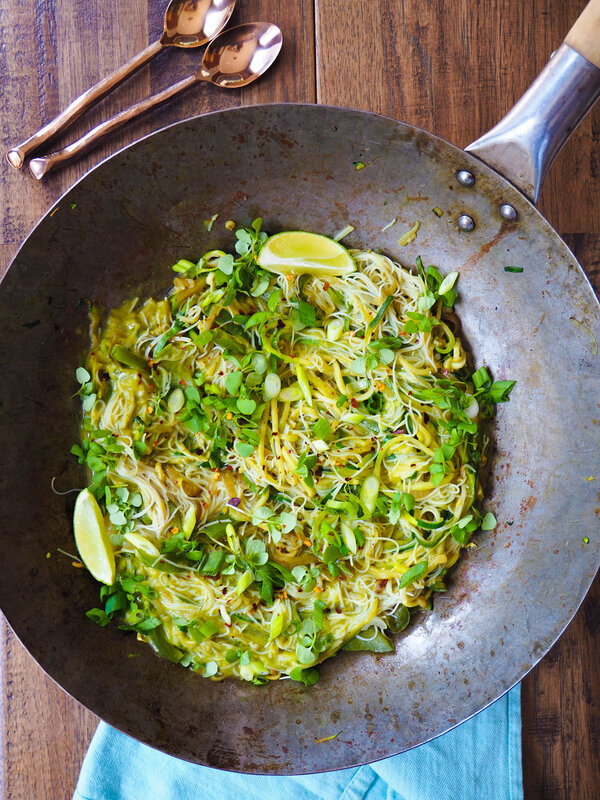 I love zoodles, but only tossed with actual noodles. Rachael without carbs ---> scary hangry situation. I used a green curry paste from Thai Kitchen. I also keep their red curry paste on hand for quick curries. If you feel like gettin' fancy, feel free to make your own. This easy one from Minimalist Baker looks pretty good. I enjoyed this as is, mainly because I forgot to pick up some tofu to go in it, but I would add some fried/baked tofu cubes, chicken or shrimp for protein. First, make the avocado sauce. Blend all the sauce ingredients in a food processor until creamy, scraping down the sides as needed. Season with salt and black pepper. Bring large pot of water to a boil and cook rice noodles according to package directions. Drain, rinse with cold water, and set aside until ready to use. Heat coconut oil in a large skillet on medium-high heat. Add onions and peppers and saute until tender, about 5-7 minutes. Add zoodles and saute until zoodles are crisp tender. Season with salt to taste. Add noodles to the skillet with the vegetables. Add sauce and toss to combine. Serve garnished with basil, sriracha, crushed red pepper flakes and lime wedges.